Are squirrels digging holes in your lawn? Squirrels bury food, not only to prepare for winter when food is harder to find, but to also ensure that they are the sole proprietor of any abundant food source. They dig for the purpose of concealment. The average squirrel will dig a hole only large enough to fit an acorn. It will put the acorn in the hole and then carefully cover the hole over with the dirt it removed, even taking the time to pat the dirt down with its paws. I’ve heard stories of people waking in the morning to discover portions of their lawn torn up and the grass ripped out. They assume it was squirrels, but I have my doubts. Unless you live in portions of the country that have burrowing ground squirrels, it’s not likely to have been a squirrel at all. Armadillos, however, are notorious for digging holes in lawns while they search for grubs and other insects at night. They have large rigid claws that can excavate soil with ease. 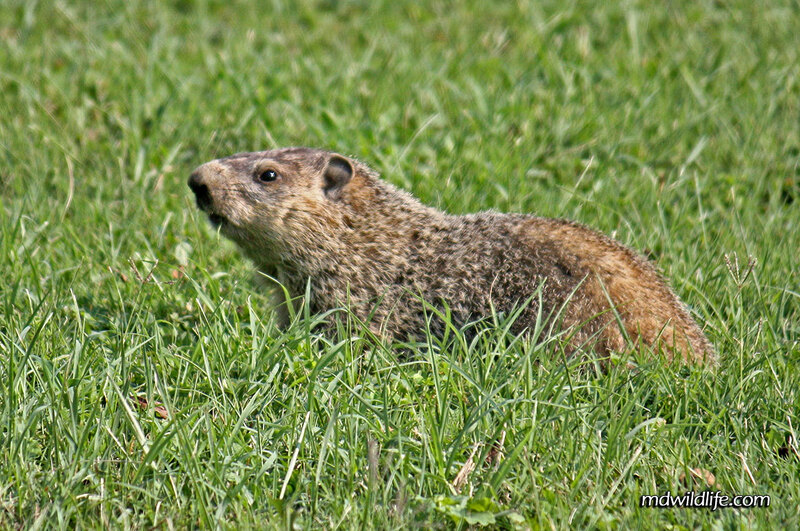 Groundhogs can also do damage to lawns, gardens and property because of their voracious vegetarian appetite and propensity for digging and burrowing. Moles dig tunnels under lawns. These are easily recognized because the soil will be pushed up in rows immediately above where the animal was tunneling. If it is, in fact, squirrels that are damaging your lawn, there are several things you can do to prevent it. To put an end to squirrel holes in lawns, I recommend using two or more squirrel deterrent methods simultaneously. That way, if any one method is only moderately effective, two or more methods used together might stop the behavior all together. To minimize squirrels digging holes in your lawn during the colder parts of the year when they are searching for the food they buried in the Fall, give them an alternative food source. Hang a squirrel feeder with some squirrel logs in your yard. Squirrel logs are large solid blocks of corn. The squirrels are not able to take away pieces to bury and instead must remain at the feeder to eat. During the Fall, if you have an oak tree on your property, raking up the fallen acorns will help to discourage squirrels from burying them throughout your lawn. During Spring, Summer and Fall it’s probably best not to feed the squirrels. The reason is that these are the times when squirrels are actively burying food in preparation for winter. Encouraging them to your property with food during this time of year may also invite them to carry acorns and other morsels from neighboring properties onto your lawn for burial. To further discourage squirrels from digging holes in your lawn, you can also put out things that create movement or noise such as wind chimes, wind spinners or pinwheel toys and move them to different places periodically so the squirrels don’t soon become accustomed to their presence. If your squirrel problem is really bad you can try trapping and relocating the squirrels.